Finding high-quality open educational resources used to be a challenge, but a number of curated OER collections have made the task much easier for educators. Here are eight sources that can help. CK-12 Foundation is a nonprofit organization that offers free, standards-aligned content in STEM subjects, including digital textbooks and simulations. The content reportedly works across all platforms and devices, including iPads, Chromebooks and Android tablets. CK-12 also offers tools to help teachers flip their classroom by creating groups, assigning content and monitoring achievement through a teacher dashboard. 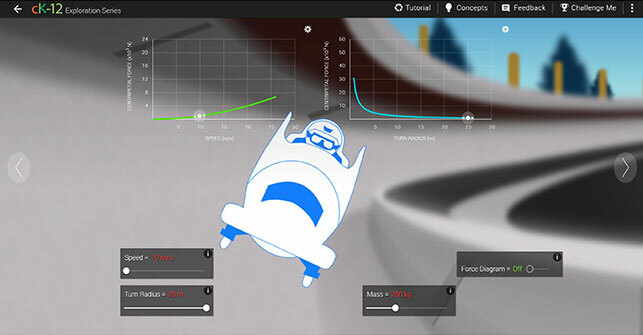 An interactive simulation of centripetal force from CK-12. Founded by Sun Microsystems more than a decade ago, Curriki became an independent nonprofit in 2006 and is one of the first sources of open educational resources for the K-12 community. Its 80,000-plus free learning resources are vetted by educators and have been accessed by nearly 12 million unique users, Curriki reported. Its corporate sponsors include AT&T, Chevron, and Oracle. Curriki provides access to more than 80,000 free educational resources. 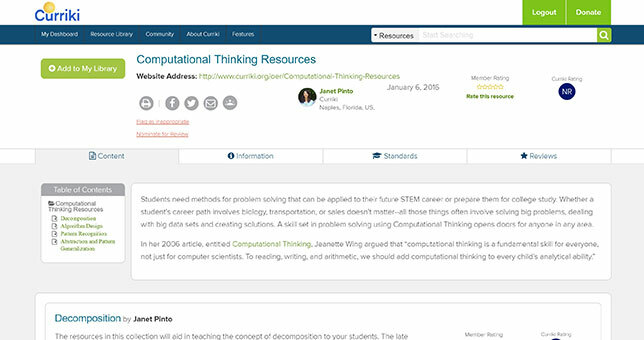 This open database of learning materials aims to help personalize instruction. 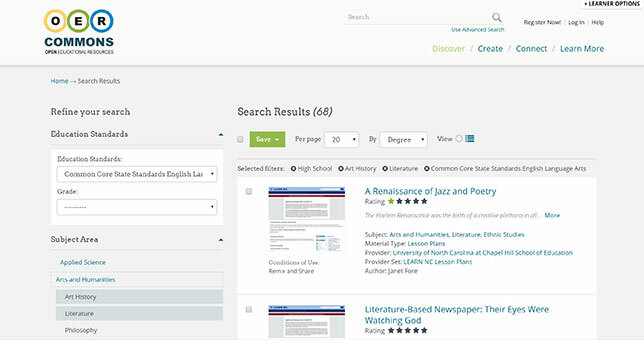 Educators can browse through thousands of collections made by teachers or search from among 16 million total resources; remix collections and customize content to meet their students' needs; share collections with students; and measure students' engagement and progress. Gooru is supported by several ed-tech funders, including Cisco, Google, Microsoft, and the Gates Foundation. Gooru's resources can be browsed by grade level, subject matter and standard. This popular online resource began with instructional videos and interactive exercises in math but now includes free online classes in math, science, computer programming, history, art, economics, and more. Teachers can have their students work on specific skills at their own pace, and a dashboard tracks students' progress. Knovation has curated a collection containing more than 360,000 vetted, standards-aligned open resources that can be accessed through the company's icurio and netTrekker. During the Texas Computer Education Association (TCEA) conference in February, Knovation said its content collection can now be integrated into different learning management systems. 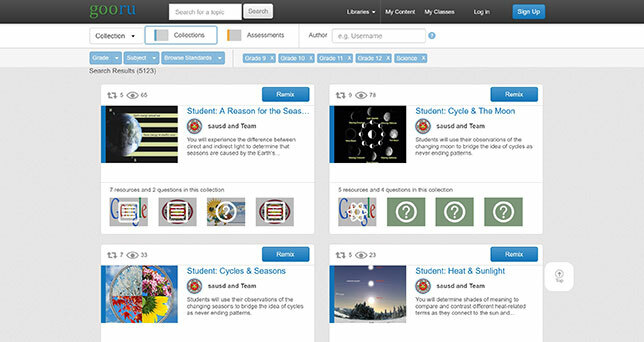 Knovation's Content Collection can be integrated into a school's LMS, LOR or library automation system. Created by the nonprofit Institute for the Study of Knowledge Management in Education, OER Commons is a freely accessible online library that allows teachers to find, create and share open educational resources. OER Commons was created in 2007 with a grant from the William and Flora Hewlett Foundation and contains more than 50,000 vetted resources searchable by subject, grade level, and content standard. OER Commons provides a meta repository for searching resources across other OER collections. Created in 2012 by a team of parents and teachers, OpenEd contains a searchable catalog of more than a million teacher-curated, standards-aligned resources. 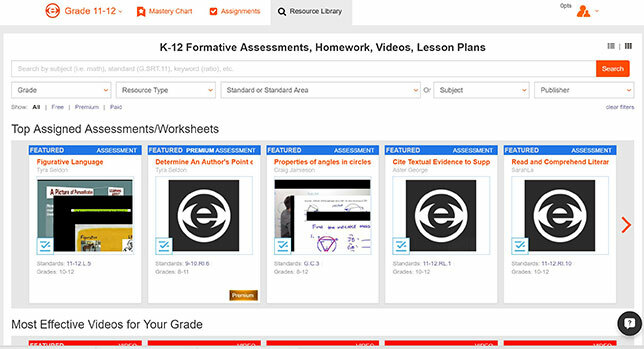 While the resources can be used with any learning management system, OpenEd also offers its own free LMS, allowing teachers who sign up for a free account to create playlists of materials that can be shared with students, parents or colleagues and to track and analyze student progress. In addition, OpenEd sells Premium subscriptions that include assessments from Pearson, Houghton Mifflin Harcourt and other educational publishers. OpenEd personalizes content recommendations based on the user's profile. Developed by the nonprofit organization PowerMyLearning, PowerMyLearning Connect is a free online platform for K-12 students, teachers, and parents to find digital content that supports the Common Core and Next Generation Science standards. 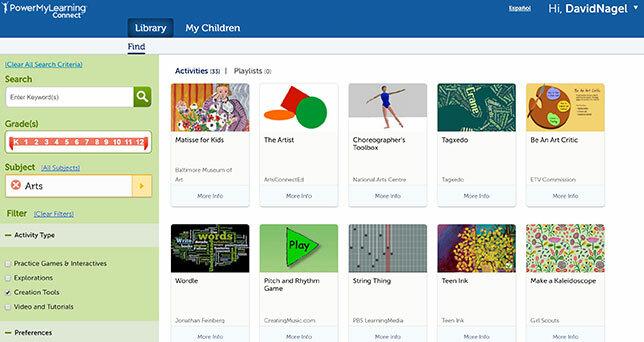 Creating a PowerMyLearning Connect account gives users free access to thousands of games, interactive simulations, virtual labs, videos and other activities tagged by subject, grade level and standard, as well as a "playlist" feature, lesson plans and usage reports. Resources from PowerMyLearning include games, interactive activities, simulations and videos.